In the past three days, I’ve surprised myself by creating a new pattern out of the blue. And quite to my own amazement, it’s actually spawned two new items. About two months ago, I bought two skeins of Knit Picks’ new Full Circle Bulky Yarn. 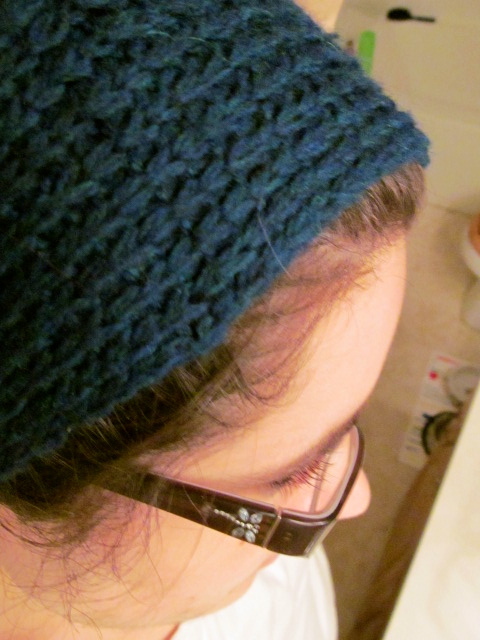 It’s a recycled wool yarn, which I was curious to try. My original intent was to turn these two skeins into a shrug, but as I started to knit, it just wasn’t coming together. I need to do some editing with the pattern and I’d like to have it test-knitted before I publish it. And I definitely need to have some bettet pictures taken…hopefully using the recipient as a model. 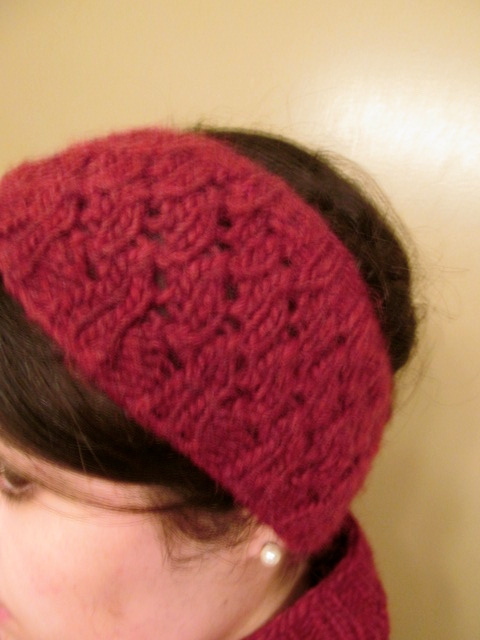 But I’m planning on releasing this pattern…around the time that winter ends. And if you’re wondering what’s with the name Miranda, look no further than the lovely daughter of Prospero from Shakespeare’s The Tempest. I love Shakespeare, and I fell in love with The Tempest when Momsy and I saw it in Stratford in the summer of 2010…starring the incomparable Christopher Plummer. 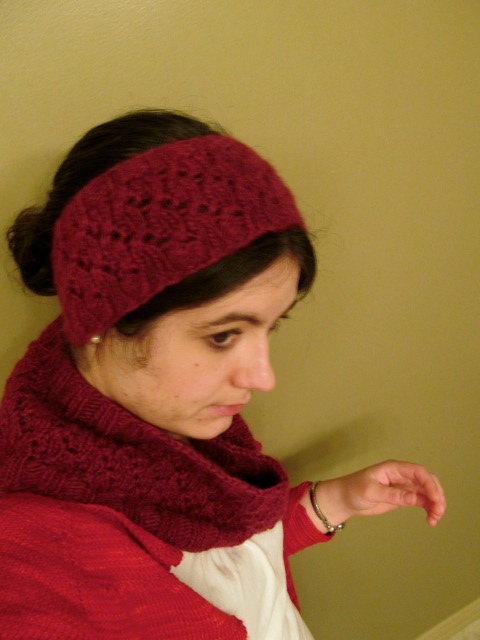 Anyway, the word tempest refers to a storm, and I’d like this headband and cowl to be perfect for keeping the wearer warm in a winter storm…or a winter tempest. And since I like to name my patterns after characters from classic literature, I decided that I had to name this one after a character from The Tempest. And since Prospero has the power to call down tempests (as he does at the beginning of the play) I decided to name this set after his daughter…the lovely Miranda. I think the name suits. I hope you agree. 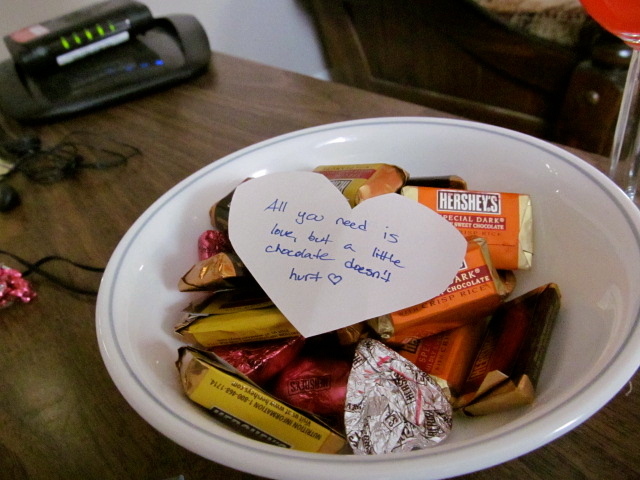 And (of course) I hope my chosen recipient loves them. A few weeks ago, I declared today the first International Sense and Sensibility Appreciation Day. So, Becky and I headed up to spend the afternoon with Katie and to appreciate Jane Austen’s first novel by watching the 20087/8 BBC/WGBH movie. If you’ve never heard this before, I love this movie. In my opinion, Dan Stevens is the perfect Edward…and Hattie Morahan is superb as Elinor. And the supporting cast is pretty great as well. We had a fabulous afternoon. 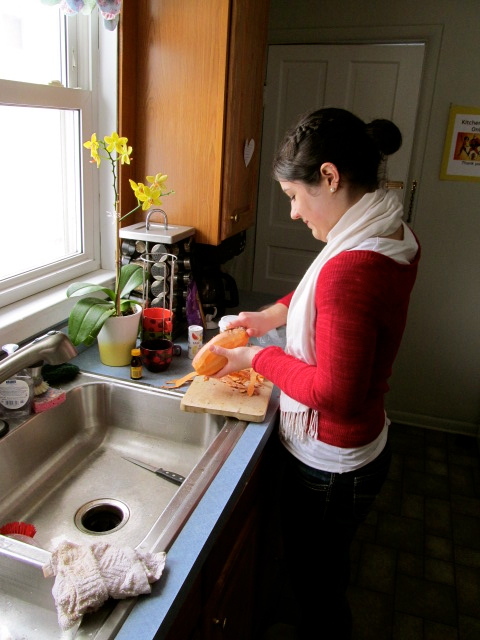 We started by making chicken and sweet potatoes for lunch. We also used various moments throughout the afternoon to document the fact that I finally finished my Georgia sweater earlier this week. I really love this sweater. It’s comfortable. The yarn (Malabrigo Sock) is delicious. 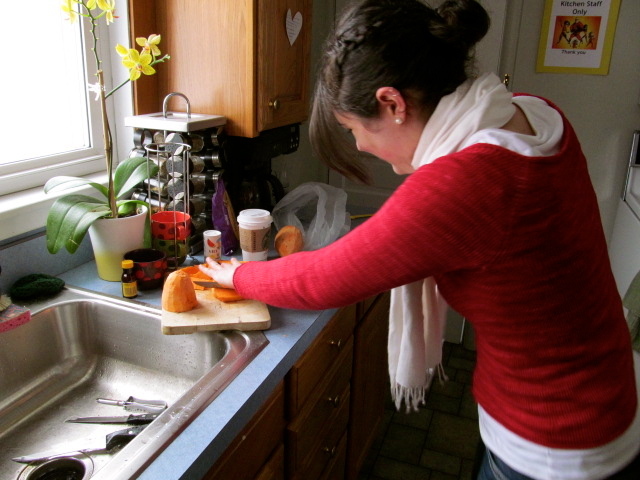 And it held up to my adventures in attempting to cut sweet potatoes. After the potatoes and chicken were done, we at lunch. And after that, we watched the movie…while eating chocolate. 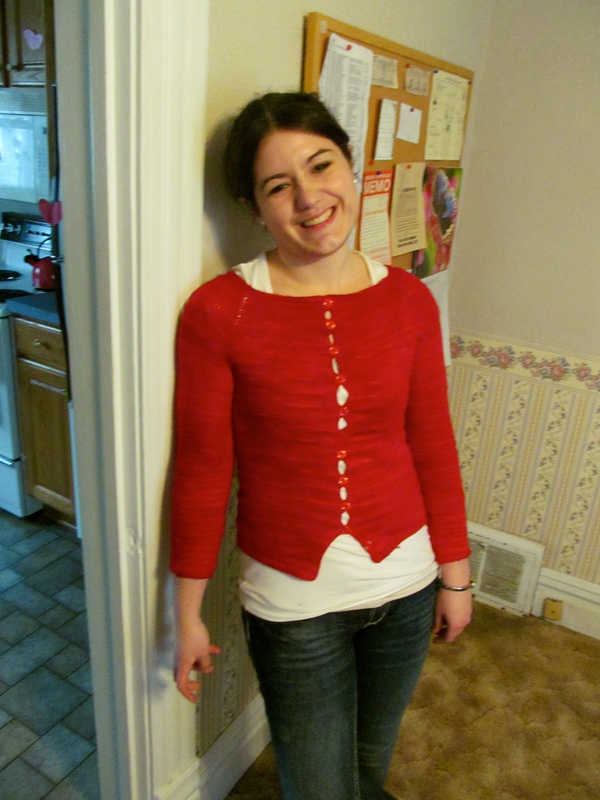 And after that, we got another picture of my sweater…because Katie and Becky are most helpful like that. And now, I’m home. S&S Day was a success. We appreciated it. And I think we’re going to keep this holiday around for a while. And my Georgia is fabulous. I’m taking a personal day today. I subbed four days last week. Then I spent the weekend focusing on a bridal shower I threw in Grand Rapids on Sunday. And then I whipped around and spent the past four days subbing again. At the end of it all, I’m exhausted. So today, I ran errands, got some sewing ideas in my head, and bought Momsy’s birthday present. My Georgia sweater is 75% done. The photo below is my progress as of 8pm (ish) last night. 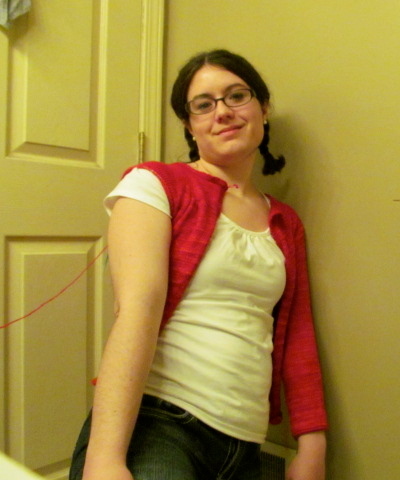 (Please ignore my awkward right arm.) The sweater is lovely. The right sleeve is coming along beautifully. I bought some lovely red buttons for it today. 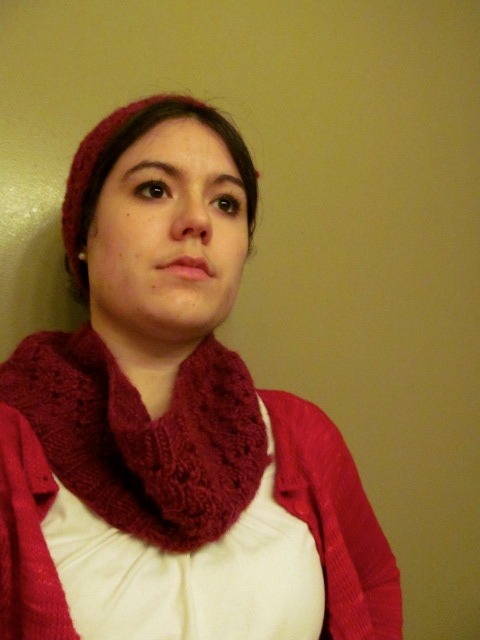 I can’t wait until I have a finished object to wear and show off. While I adore the Georgia and am ridiculously excited to have it finished, I took a few breaks from it to do some instant gratification knitting. 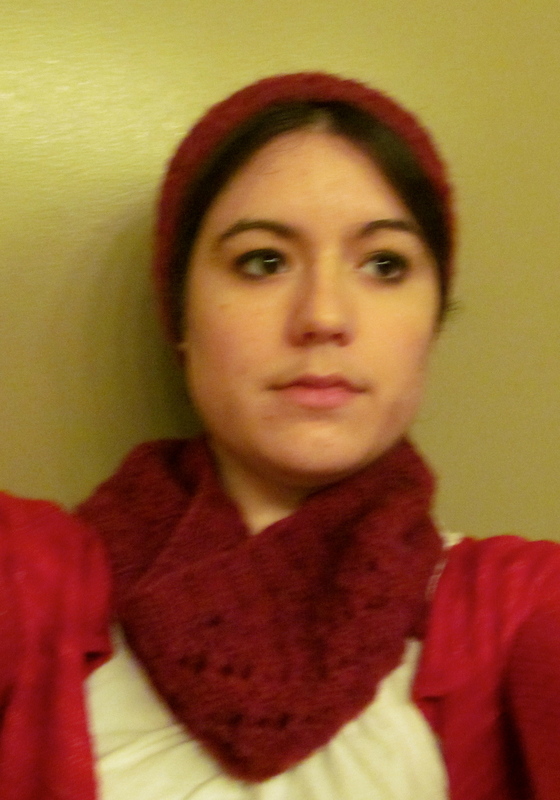 Both projects were test knits, so I don’t have pattern links for you-yet. 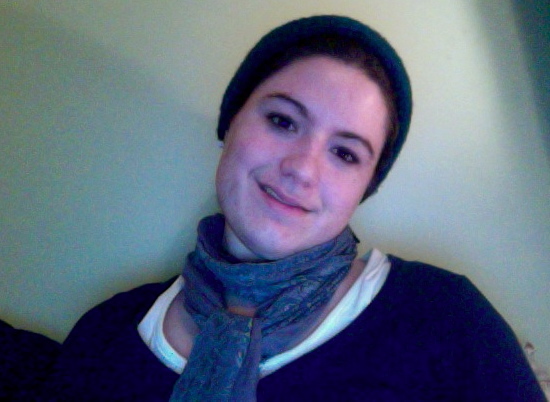 But I’m still going to show the lovely things (a hat and a headband) off. Byzantine Lent starts on Monday. I still don’t know what I’m doing for Lent. I think I’m going to read Jesus of Nazareth this Lent, which would fulfill another of my 12 goals for 2012. But I just came up with that idea while typing this blog post, so I need to think about that before I commit to it. I bought this pattern today. I bought it to make the dress, but now I also really want to make the top and the pants. I almost bought fabric to make the top today but the line was really long and I just wanted to finish my errands and get home. I’m knitting a hat right now. 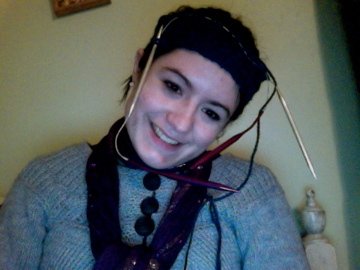 And as I often do while knitting hats, I decided to try it on. And then, I realized that I looked like someone quite familiar to a woman whose favorite Disney movie is Beauty and the Beast. Yeah, it’s a bit disturbing, but that’s what happens when you’re working with two circular needles at the same time. You find yourself turning into the crazy inventor who left his daughter in the Beast’s castle. February is already ten days old and I haven’t posted yet, so I thought I’d catch you up to speed on a bit of my life of late. I sub. I have taught pretty much every grade from kindergarten to 12th graders in the past few weeks. I’m co-throwing a bridal shower on Sunday. Currently, I’m preparing 20 bags of chocolate as favors. And I’m making an awesome heart-shaped chocolate cake with cupcakes-all with chocolate frosting and blue and purple gel frosting decorations. This makes my life. 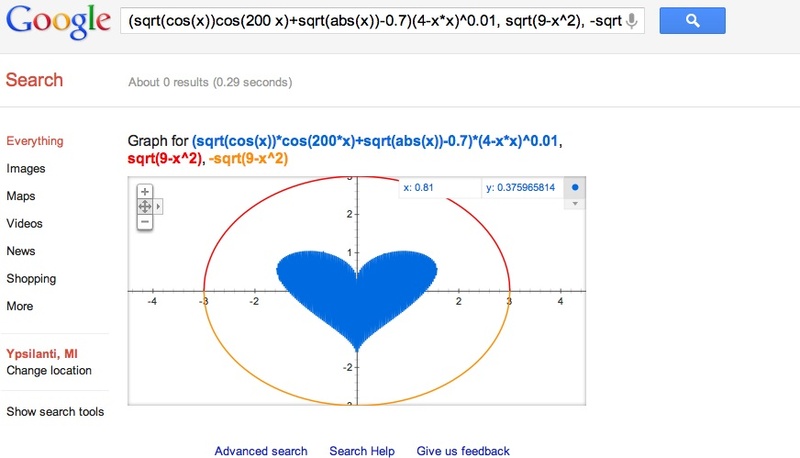 I made this using google yesterday and took a screenshot. I love it. 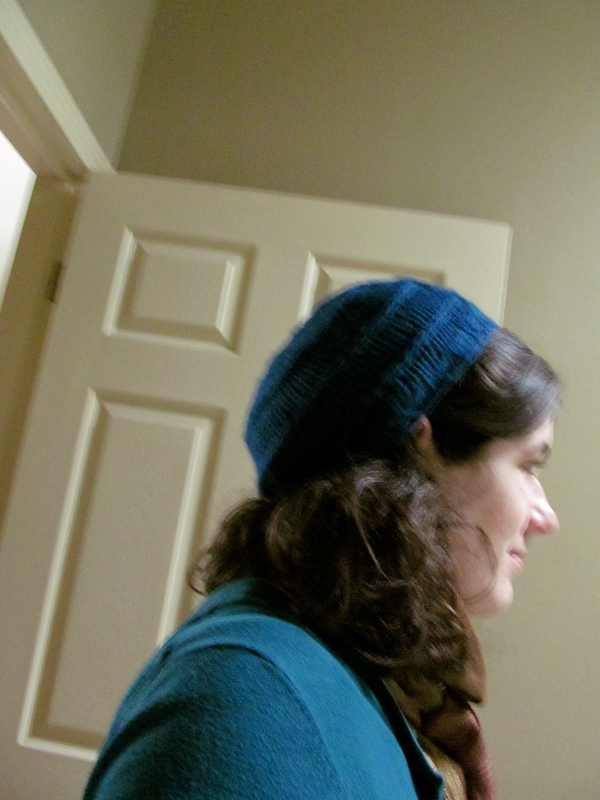 I finished this hat a while ago but I haven’t blogged about it yet. 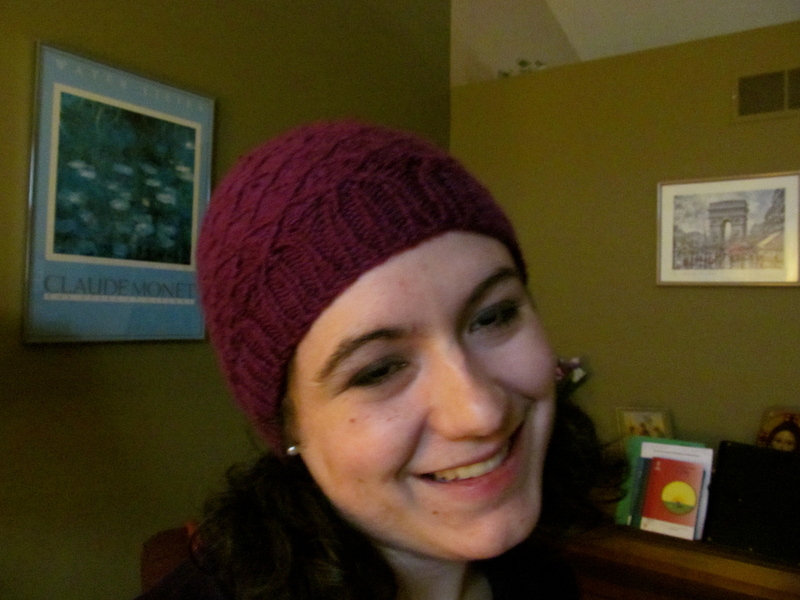 I was test-knitting an awesome pattern for Elisa McLaughlin. Knitting sleeves in stockinette using sock yarn on size four needles takes forever. For.Ever. I thought this sweater would be done by now but it will probably take another week.